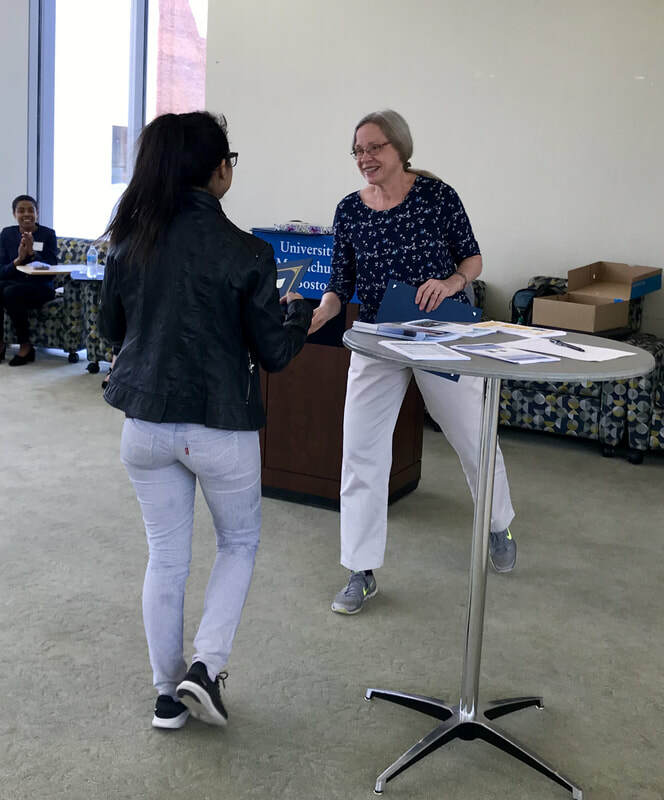 Elicia Kelley won the Psychology Department's Samuels Prize for her paper titled “The Nonselective Visual Pathway of Scene Recognition and its Development”. Congratulations, Lici! In September 2019, Yibiao Liang will join the DBS program under the mentorship of Erik and Zsuzsa. Yibiao received a Masters degree from Zhejiang Normal University in China, where he worked on the neural bases of Theory of Mind abilities in preschoolers. He is moving to Boston from Hangzhou, China. Congratulations to Sarah Izen for defending her dissertation proposal on February 1st! 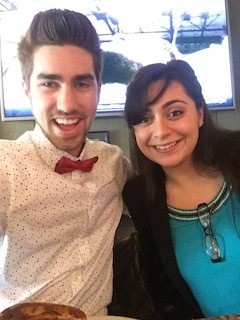 Her committee members were Vivian Ciaramitaro, Richard Hunter, Mohinish Shukla, and Sam Ling from Boston University, Psychological and Brain Sciences Department. Zsuzsa and Mihye participated in the ninth annual BCCCD meeting in Budapest, Hungary (BCCCD19, January 3-5, 2019). Congratulations to Julie L. Freschl for successfully defending her dissertation proposal on December 12th! Erinda Morina and Mollie Hamilton started the DBS PhD program this fall. Erinda Morina earned her bachelor’s and master’s in Public Health from the University of Medicine Tirana in Albania, and then she earned a B.S. degree in Psychology at the University of Massachusetts Boston. Mollie Hamilton earned a bachelor’s degree in Opera Performance and two master’s degree in French Studies and Cognitive Science. Erinda will be working with Dr. Vivian Ciaramitaro and Mollie with Dr. Zsuzsa Kaldy. 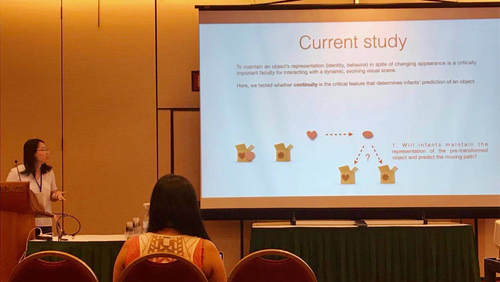 CHEN CHENG gave her first talk at a major international conference, at the annual meeting of the Cognitive Science Society in Madison, WI! Congratulations Chen! HIU MEI (DORIS) CHOW has defended her dissertation titled "AN EXAMINATION OF THE INTERACTION OF ATTENTION AND CROSSMODAL CORRESPONDENCES WITH DEVELOPMENTAL AND NEUROPHYSIOLOGICAL APPROACHES" on July 11. Congratulations to Dr. Chow, the fourth PhD of the Baby Lab! Freschl, J., Melcher, D., Carter, A. S., Kaldy, Z., & Blaser, E. (2018). Visual Temporal Integration Windows are longer in 2-year-old toddlers with Autism Spectrum Disorder. Poster presented at the International Conference on Infant Studies, June 30-July 3, 2018, Philadelphia, PA.
Dr. Allison Fitch and Dr. Hayley Smith received their doctoral hoods today! 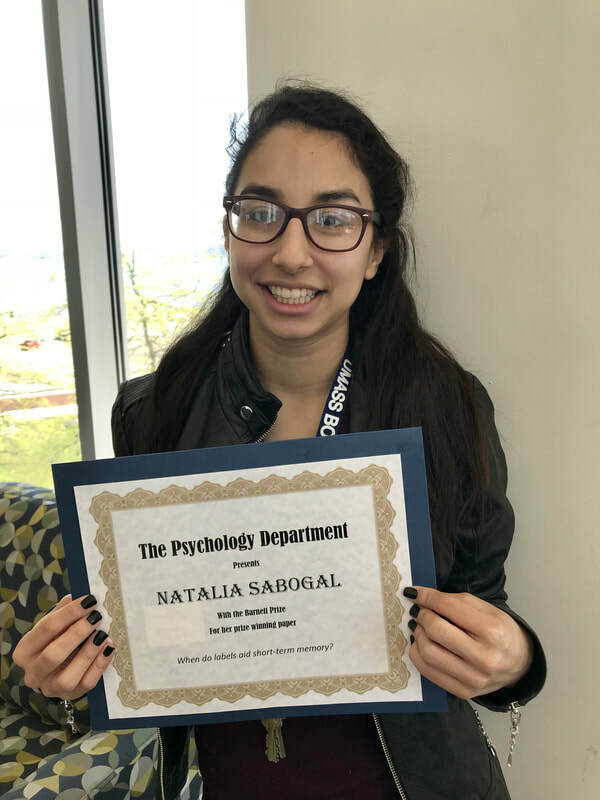 Under the guidance of Dr. Zsuzsa Kaldy, her undergraduate research assistant, Natalia Sabogal, was awarded the Barnett Prize for the best undergraduate research paper-- "When Do Labels Aid Short-term Memory? ", (2017-2018) at the Psi Chi Graduation Reception to honor Psychology graduating undergraduates. 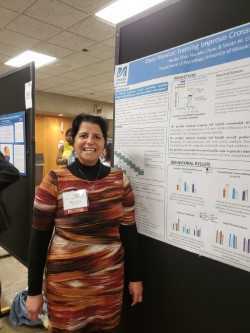 Under the guidance of Dr. Vivian Ciaramitaro, eight of our undergraduate research assistants, Erinda Morina, Neuba Silva, Newton Jordao, Xenia Leviyah, Kaitlin Parent, Valerie Goutama, Aleksandra Sabov, and Nicolas Raymond attended the 24th Annual Massachusetts Statewide Undergraduate Research Conference. Xenia Leviyah presents her poster: "Interactions between stimulus salience and timing determine the extent to which a sound alters visual detectability." Newton Jordao presents on his poster: "Video Gamers Outperform Non-Video Gamers in Crossmodal Attention." Neuba Silva presents her poster: "Does Musical Training Improve Crossmodal Attention?" Both Valerie Goutama and Kaitlin Parent present their poster: "How the Emotion We See is Influenced by the Emotion We Hear Depends on the Visibility of a Face." 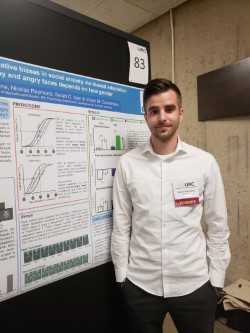 Nicolas Raymond presents his poster: "Maintained negative biases in social anxiety via biased adaptation to happy and angry faces depends on face gender." 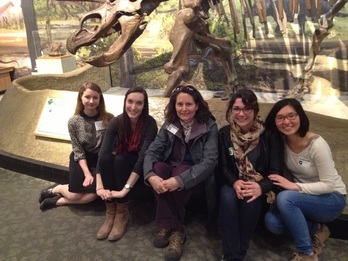 A group photo of our research assistants at the 24th Annual Massachusetts Statewide Undergraduate Research Conference. Under the mentor-ship of Dr. Mohinish Shukla, his graduate students, Mihye Choi and Ertugrul Uysal also presented their work at the same conference. Doris Chow, our graduate student, and Brianna Leonardo, our research assistant presenting their poster: "Is a round shape integrated with a /bouba/ sound? Enhanced neuronal signals at the intermodulation frequencies of congruent audio-visual stimuli." 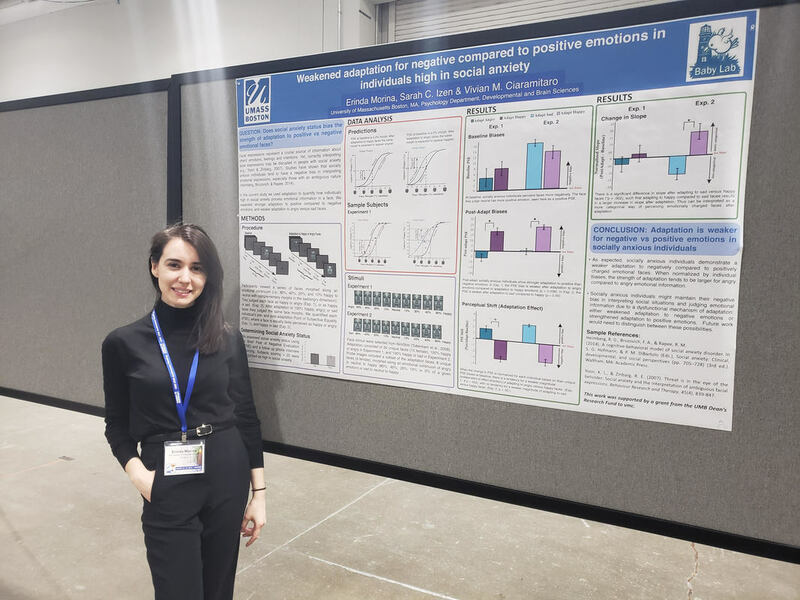 Erinda Morina, one of our research assistants, presenting her poster: "Weakened adaptation for negative compared to positive emotions in individuals high in social anxiety." Dr. Vivian Ciaramitaro's graduate student Sarah Izen and research assistant Cheryl Ellis ran a total of 17 individuals, who ranged from children, high school student, to young adults, in their current face study at the Museum of Science Health Fair. The Museum of Science held this health fair to spark the interest of those who want to know more about how our brains work and how to become a part of science! Two high school student who participated in our face study. Sarah Izen, our graduate student, running a high school student at the Museum of Science Health Fair. Cheryl Ellis, our research assistant, running a high school student at the Museum of Science Health Fair. 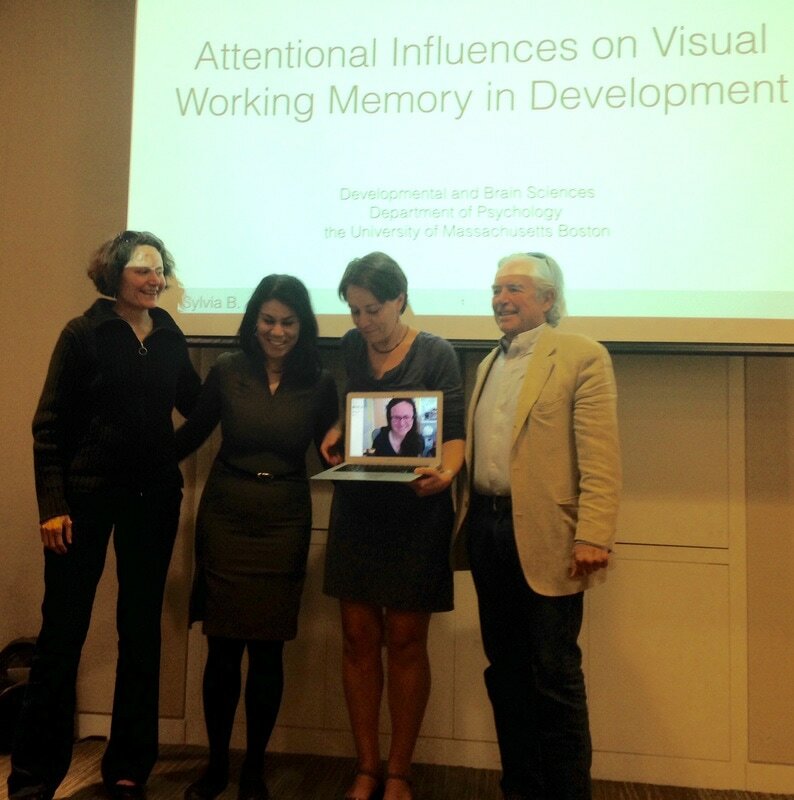 HAYLEY SMITH has defended her dissertation titled "THE EARLY DEVELOPMENT OF VISUAL ATTENTIONAL MECHANISMS IN AUTISM SPECTRUM DISORDER" on March 6. Congratulations to Dr. Smith, the third PhD of the Baby Lab! Shivaun Bennett, (Baby Lab Research Assistant in Spring 2017, BS in 2017) just got accepted to the Nurse Practitioner's Program of Simmons College! Congratulations, Shivaun! A research paper by Dr Zsuzsa Kaldy and her collaborators at De Paul University (Sheila Krogh-Jespersen) and University of Chicago (Amanda Woodward) just got published in Autism Research! Other co-authors were Dr. Alice Carter and Annalisa Valadez. 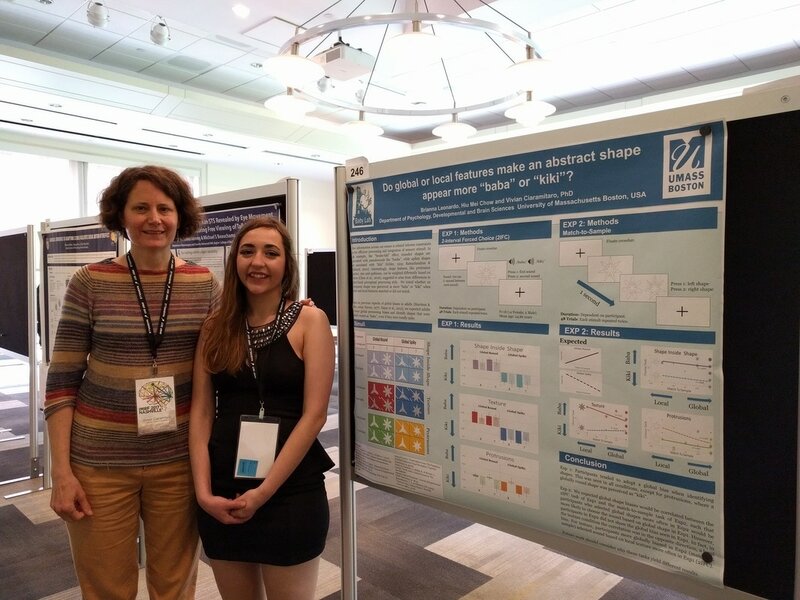 Under the supervision of Dr. Vivian Ciaramitaro, three of her undergraduate research assistants, Erinda Morina, Xenia Leviyah, and Audrey Zutrau, recently attended the annual New England Psychological Association Conference at Williams James College. Attention determines how exposure to emotional information effects mood. Xenia Leviyah, Sarah Izen, and Dr. Vivian Ciaramitaro, New England Psychological Association, Williams James College, MA, October 21, 2017. Changes in perceiving and reacting to emotional faces in individuals high in social anxiety. Erinda Morina, Sarah Izen, and Dr. Vivian M. Ciaramitaro, New England Psychological Association, Williams James College, MA, October 21, 2017. 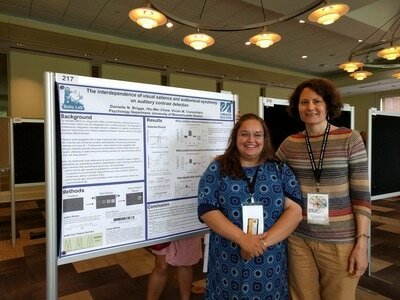 Below on the right is a picture of Audrey Zutrau who also attended this conference as part of the research portfolio. Sylvia Guillory's research paper that was based on part of her dissertation was accepted for publication at the Journal of Experimental Child Psychology! Allison Fitch has defended her dissertation titled "EXPLORING TODDLERS’ USE OF LANGUAGE TO UPDATE MENTAL REPRESENTATIONS: EVIDENCE FROM CHILDREN WITH AND WITHOUT AUTISM SPECTRUM DISORDER" on July 7, 2017. Congratulations to the second PhD of the Baby Lab! Allison will start working as a postdoctoral researcher at Boston University in August, 2017. Under the supervision of Dr. Zsuzsa Kaldy and Dr. Vivian Ciaramitaro, three research assistants recently graduated with honors. Laura Keegan graduated with honors from the Honors College. Nilam Thaker graduated with honors from the Honors College and Honors in Psychology. Danielle Briggs also graduated with honors from the Honors College and Honors in Psychology. Congratulations you three on your hard work and dedication! Good luck with your future endeavors! ​Sylvia Guillory has defended her doctoral dissertation on May 16, 2017. She is the first student to graduate with a PhD from the Baby Lab! Congratulations, Dr. Guillory! 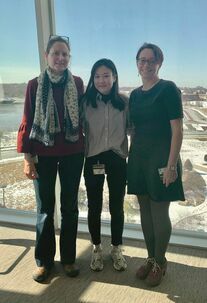 Graduate students Doris Chow and Hayley Smith are the recipients of the International Student Research Grants from the Office of Global Programs at UMB. Dr. Zsuzsa Kaldy and Dr. Erik Blaser have also received a faculty research grant from the same office. Graduate students Doris Chow and Mihye Choi are the recipients of the Graduate Student Assembly Craig R. Bollinger and the Dr. Robert W. Spayne Research Grants, respectively. 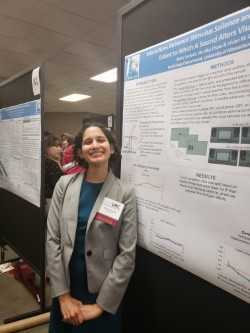 Doris was awarded the Bollinger grant to support her dissertation research where she plans to examine multisensory influences on perception and attention early in development using visual and auditory stimuli calibrated along a meaningful, amodal, dimension: stimulus salience, to be equally interesting and engaging. She plans to quantify how the relative salience of a stimulus in one modality alters attention and detectability of a stimulus in another modality. Mihye’s award for her master’s work will investigate how infants learn phonemes based on frequency distributions of speech sounds in an ambient language. She is studying whether infants are still able to discriminate the sounds when presented with speaker variations and how infants use visual information in order to learn phonemes. Congratulations, Doris and Mihye! Graduate students Allison Fitch & Chen Cheng were accepted to present their respective work at the Biennial Meeting of the Society for Research on Child Development in April 2017! Graduate student Doris Chow was accepted to attend the Rethinking the Senses Spring School in April 2017 in Dubrovnik, Croatia! 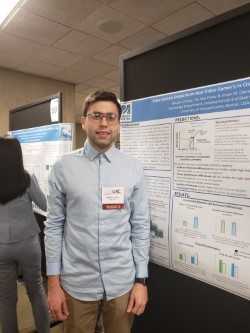 The Baby Lab welcomes two new graduate students: Ertu Uysal, who is working under the supervision of Dr. Shukla, and collaborator Julie Freschl, who is working under the supervision of Dr. Erik Blaser. We have uploaded our Summer 2016 Newsletter for the lab. 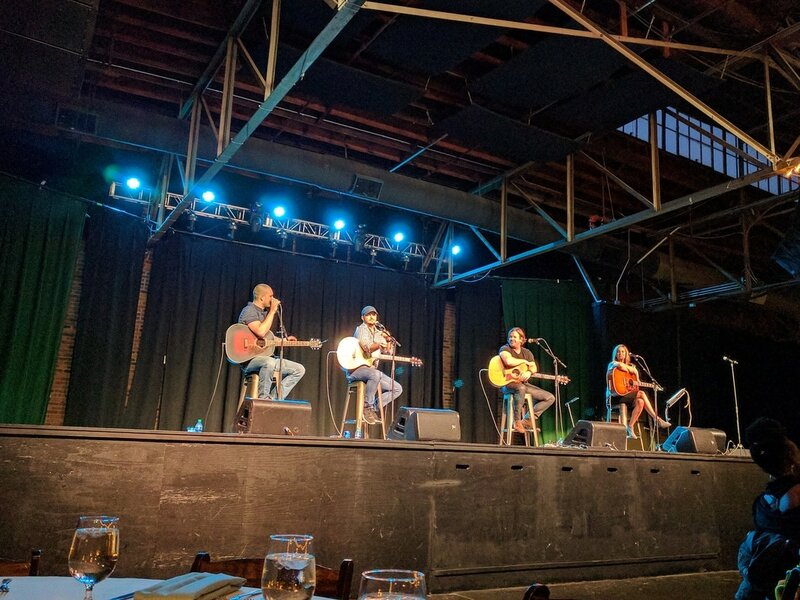 Check it out for all the newest updates and information! Click Here! Under the supervision of Dr.Vivian Ciaramitaro (center), three more research assistants recently graduated with honors. Daniel Harris (right) graduated with honors from the Honors College and Honors in Psychology. Brandon Mui (left) graduated with honors from the Honors College and Honors in Biology. Kimberly Ellis (not pictured here) also graduated with honors from the Honors College. Congratulations you three on your hard work and dedication! We will miss you! Undergraduate Abrar Ahmed and Professor Vivian Ciaramitaro at the Biology Honors Ceremony. Abrar worked with Professor Ciaramitaro's Social Perception Lab in order to complete a project for her Biology Honors Program. Congratulations Abrar! Cheng, C. Kaldy, Z. & Blaser, E. (2016). Accounting for cognitive effort in a visual working memory task in 13- and 15-month old infants. Poster presented at the Annual Meeting of the Vision Sciences Society, May 13-18, 2016, St. Pete Beach, FL. 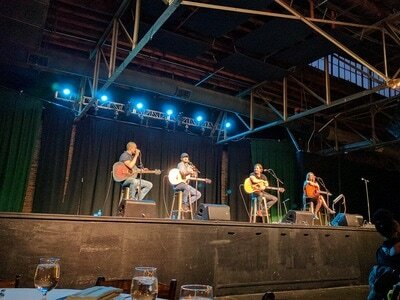 Guillory, S.B., & Kaldy, Z. (2016). Quantifying the effect of a distractor on the fidelity of visual working memory representations in 4-7-year-old children and adults. Poster presented at the Annual Meeting of the Vision Sciences Society, May 13-18, 2016, St. Pete Beach, FL. 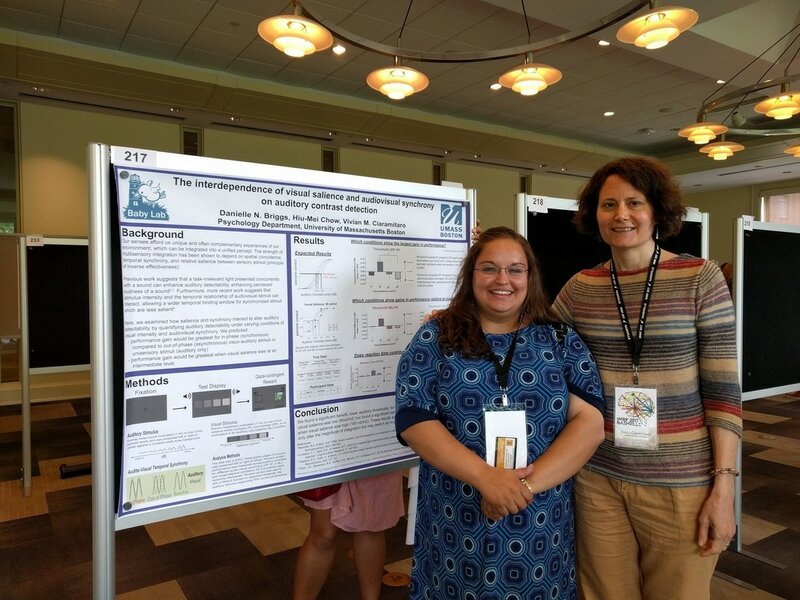 Graduate student, Sylvia Guillory, will participate in the Methods in Computational Neuroscience course at the Summer School at Woods Hole which involves understanding how the brain can solve complex computational problems at the molecular to cognitive/behavioral levels though decomposing these processes into manageable mathematical units. From her participation in this year's course, Sylvia plans to strengthen her computational background and delve into new modeling techniques that will help build her career as a research scientist. The development of emotional interactions across the senses: Interactions between visual and auditory emotional information ­in children versus adults Keri Swenson, Hiu Mei Chow, Sarah Izen and Vivian M. Ciaramitaro. Dr. Vivian Ciaramitaro with her undergraduates: Danielle Briggs, Keri Swenson, Anh Phan, Brandom Mui, Tracy Tam, Vickee Sanchez, Sasha Sabov, and Terrence Cook attended the UMass Amherst Undergraduate Research Conference. Anh Phan presented the poster: Cross-modal adaptation to emotional information: Influences on the magnitude and rate of perceptual change. Danielle Briggs presented the poster: Interactions between visual salience and synchrony on auditory detectability in adults. Terence Cook presented the poster: Perceptual biases for negative emotions in social anxiety. 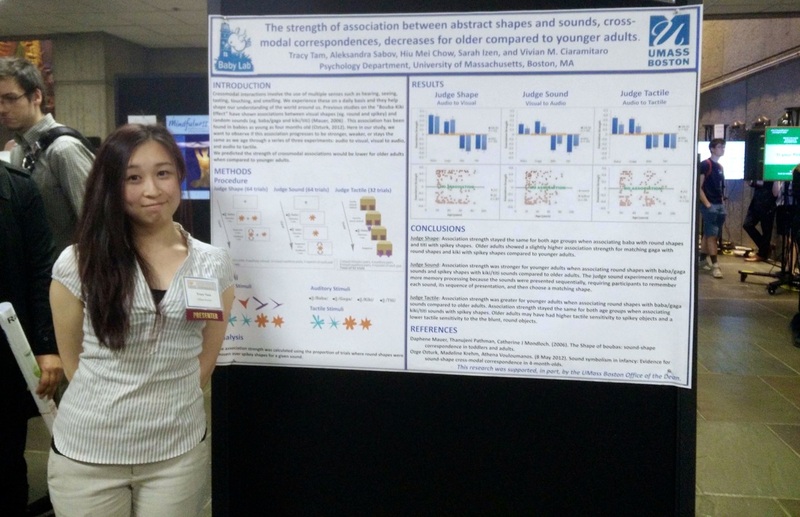 Tracy Tam and Aleksandra Sabov presented the poster: The strength of the association between abstract shapes and sounds, cross-modal correspondences, decreases for older compared to younger adults. Victoria Sanchez presented the poster: Does this feel familiar? Repeated exposure strengthens crossmodal correspondence associations. Tracy Tam presenting her poster at the conference this past weekend! Dr. Vivian Ciaramitaro, Doris Chow, Sylvia Guillory, Dan Harris, and Ahn Phan presented posters at the 2016 Cognitive Neuroscience Society Annual Meeting. 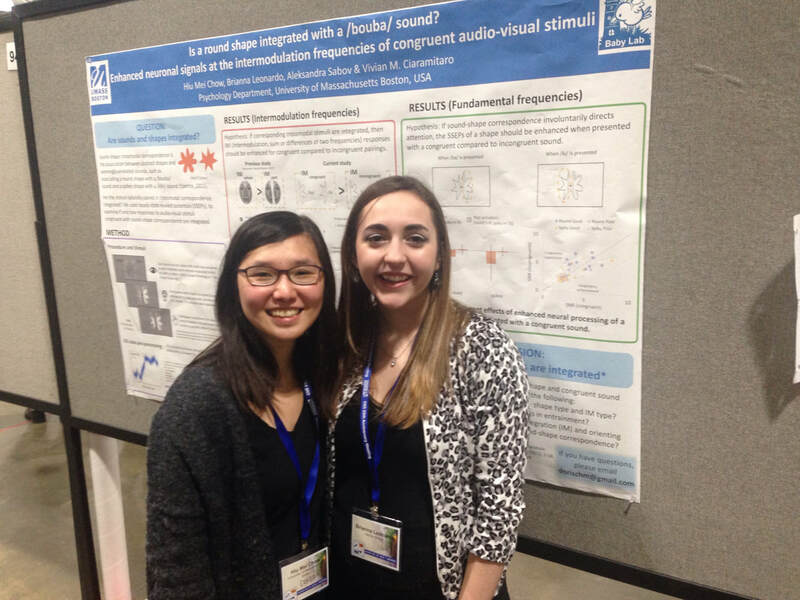 Sylvia Guillory, Doris Chow, and Professor Ciaramitaro presented their poster: Matching a shape and a sound: Does sound-shape correspondence modulate a neuronal signature of visual shape processing? 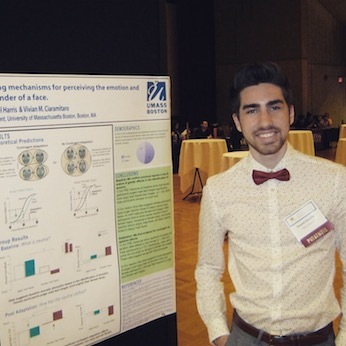 Dan Harris and Professor Ciaramitaro presented their poster: Interdependent mechanisms for processing the gender and emotion of a face. 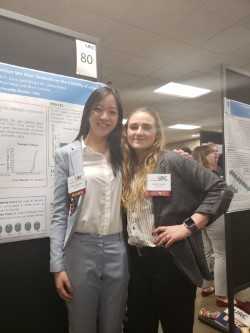 Ahn Phan and Professor Ciaramitaro presented their poster: Hearing an emotion alters how we see emotion in a face and the corresponding physiological stress response. Dr. Zsuzsa Kaldy, Dr. Erik Blaser and Dr. Mo Shukla have been awarded a major research grant by the National Institutes of Health (Eunice Kennedy Shriver National Institute of Child Health and Human Development). The goal of this grant is to characterize the role of focused attention in visual working memory in infants and toddlers using pupillometry. Sangya Dhungana began her position as the new Lab Manager in November, 2015. Sangya received her BA in Psychology from UMass Boston in the Spring of 2015. Prior to taking on her new position, Sangya served as research assistant in the lab for nearly three years. Daniel Harris, Shan Luo & Professor Vivian M. Ciaramitaro present their poster "Why so angry? Investigating gender bias in the identification of emotion" at the New England Psychological Association Conference (NEPA) at Fitchburg State University. Sandy Eid, Hiu Mei Chow, Daniel Harris, Victoria Sanchez & Professor Vivian M. Ciaramitaro present their poster "Does a baba sound feel spikey or round to you? Crossmodal correspondence across the audio-somatosensory modalities". Daniel Harris and Professor Vivian M. Ciaramitaro gave a talk "What’s in a face? Investigating mechanisms for processing gender and emotion in a face". The Honorary Undergraduate Scholars Award (HUS) is awarded at the New England Psychological Association (NEPA) conference. The awards program recognizes recognize students with high achievement in undergraduate records in psychology and aims to encourage students to pursue careers in the discipline. 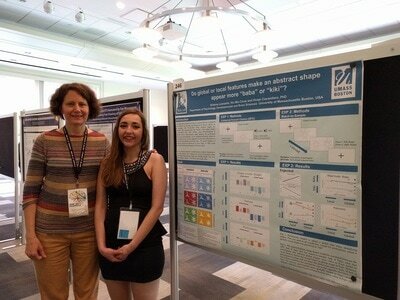 Allison Fitch attended the Cognitive Science Society Conference in Pasadena California. She presented her research on toddlers and verbal testimony. 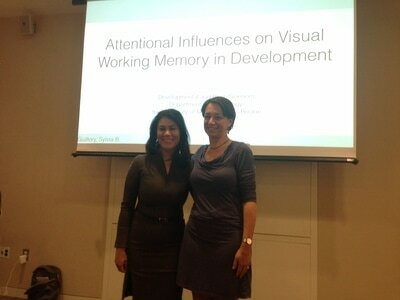 Dr. Vivian Ciaramitaro and Doris Chow attend the in 16th International Multisensory Research Forum. They present their reserach on cross-modal interactions. Sarah Izen and Mihye Choi will be starting the DBS PhD program in the Fall. Sarah Izen earned her BA in neuroscience and psychology at Smith College and then received her Master's at Boston University. Mihye Choi completed her BA at Sungshin Women’s University in Seoul, Korea and then earned her Master's degree at Ang University in Seoul, Korea. Sarah will be working with Dr. Vivian Ciaramitaro and Mihye with Dr. Mohinish Shukla. 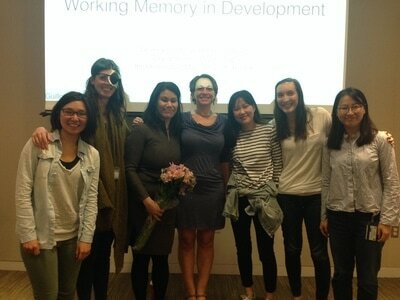 Graduate students Hayley Smith, Allison Fitch, and Doris Chow presented their mentored research projects. Doris Chow began the symposium with her presentation titled "How much spikier is 'kiki'? Quantifying individual differences in the strength of sound-shape correspondence". This was followed by Allison Fitch and her work on "The role of labels in infants' visual working memory". Hayley Smith concluded the talks with her presentation on the "Susceptibility to distraction in toddlers with and without ASD". Honors student Dan Harris presents poster "Face Adaptation: A window into mechanisms of social anxiety" at 2015 ADAA Conference in Miami, FL. Graduate Student Doris Chow and Professor Vivian Ciaramitaro present poster "Research and Education in Parallel: Scientific Outreach through In-site Experiments at the Museum of Science Boston Living Laboratory" at UMass Boston 4th Annual Community-Engaged Partnerships Symposium: Teaching, Research, and Service. Graduate student Doris (Hiu Mei) Chow publishes her research in Consciousness and Cognition. Her research was conducted as a Master's student at the the University of Hong Kong. Congratulations, Doris! For older news, click here!